Do angels have belly buttons like humans? Probably not. Yet, no flesh man knows for certain, because angels sent by GOD, are normally fully clothed in white (at least the righteous ones are). What we do know is that all souls were created by our FATHER and belong to Him. womb = H7358. rechem (rekh'-em) - From H7355; the womb (compare H7356): - "matrix", womb. Souls are ageless and babies aren't born with baby souls, so to speak. Our spiritual bodies don't age, or get old, only our flesh bodies do. The stories, in the Bible, of angels appearing unto men, don't ever state that they're elderly in appearance. You might be experiencing old age in the flesh, but your spirit feels as young as it was decades ago. If you have a few gray hairs on your head, than you know exactly what I mean and, sometimes, no words can describe the things that your heart and spirit know. As angelic, spiritual beings, in the First Earth Age, we witnessed the death of animals in the flesh. However, even at this present moment, none of GOD's children have experienced the second death, which is the the death of the soul (Rev 20:14-15). Even satan, the only entity, by name, that has been sentenced to perish, by GOD, is still alive. With that said, satan or lucifer, a protector of the Mercy Seat, wanted to be GOD. Pride got the better of the devil. Sin and misery love company (Pro 1:10) and that old serpent, the devil, deceived one-third of GOD's children into following him. GOD's children number in the billions, and easily over 10 billion, so one-third is a lot of souls to destroy due their wickedness. We now have approximately seven billion people living in the flesh. In 1 A.D., the world's total population may have been only several hundred million. Once all souls, except those who have no resurrection (such as satan), are birthed through the matrix, that's it. There are no more students (souls) to fill the classroom (world). The religious and educational systems make understanding truths complicated, but it's not, when we have wisdom and understanding in our FATHER's WORD. Not wanting to destroy billions of rebellious children, GOD decided to destroy the Age instead. GOD knew that many of us had trouble understanding the finality of death and couldn't grasp the true appreciation for Eternal Life. Even though we might have witnessed death in animals, which were in flesh bodies, we didn't go through anything like it in angelic bodies. Evil cannot dwell with ALMIGHTY GOD, especially not in the eternity. But what father would want any of his children to perish? So GOD had a plan, a Perfect One, whereby His children could be saved from the same fate as lucifer, which is the permanent death of the soul. "For the wages of sin is death; but the gift of GOD is eternal life through Jesus CHRIST our Lord" (Rom 6:23). And so you came forth through the matrix, or womb, born of water, the bag of waters, to be tried like gold and refined as silver, to choose Life in Jesus or death with satan. From umbilical cord to umbilical cord, and mother to child, Jesus Christ's birth came through mother Eve's daughter, the virgin Mary. No other man has ever been born of a virgin. There's no story like the birth, death and resurrection of our LORD and Savior Jesus CHRIST. Jesus was "Emmanuel", meaning "GOD with us", being birthed through the matrix, to live a selfless and perfect life, and to offer salvation to mankind. CHRIST was the Lamb of GOD and His death on the cross was the ultimate sacrifice, to pay your ransom and free you from sin. Remember, as men, we all fall short and sin, and in this world, satan buys us with sin. Who do you think is the only ONE qualified to pay your ransom in full? Matthew 1:20 "But while he thought on these things, behold, the angel of the LORD appeared unto him in a dream, saying, Joseph, thou son of David, fear not to take unto thee Mary thy wife: for That Which is conceived in her is of the Holy Ghost [Spirit]." Matthew 1:21 "And she shall bring forth a Son, and thou shalt call His name JESUS: for He shall save His people from their sins." Matthew 1:22 "Now all this was done, that it might be fulfilled which was spoken of the LORD by the prophet, saying,"
Matthew 1:23 "Behold, a virgin shall be with child, and shall bring forth a Son, and they shall call His name Emmanuel, which being interpreted is, GOD with us"
Luke 1:30 "And the angel said unto her, Fear not, Mary: for thou hast found favour with GOD." Luke 1:31 "And, behold, thou shalt conceive in thy womb, and bring forth a Son, and shalt call His name JESUS." Luke 1:32 "He shall be great, and shall be called the SON of the Highest: and the LORD GOD shall give unto Him the throne of His father David:"
Luke 1:33 "And He shall reign over the house of Jacob for ever; and of His kingdom there shall be no end." Luke 1:34 "Then said Mary unto the angel, How shall this be, seeing I know not a man?" Luke 1:35 "And the angel answered and said unto her, The Holy Ghost [Spirit] shall come upon thee, and the power of the Highest shall overshadow thee: therefore also that holy thing which shall be born of thee shall be called the Son of GOD." The belly button, or navel, is clinically known as the umbilicus. It's the scar on the abdomen at the original attachment site of the umbilical cord. The birth cord is the lifeline, or conduit, between the developing embryo, or fetus, and the placenta. 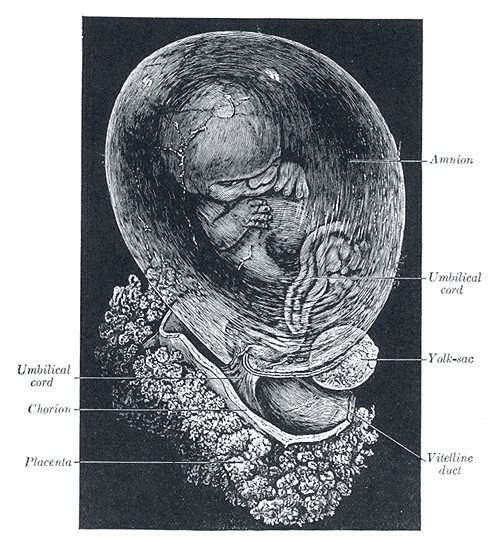 The umbilical cord, which develops from the placenta, connects the mother and the baby. The baby develops and grows inside the bag of waters, or amniotic sac, inside the woman's womb. The amniotic sac is also called the membranes, due to the sac being made of two membranes, the amnion and chorion. The fetus literally floats and moves in fluid, inside the amniotic sac, and the mother supplies nutrients through the placenta and umbilical cord. So your first experience in this flesh life is that of floating, drinking and breathing in amniotic fluid. Your mind is a blank sheet of paper, having no knowledge of what was prior to and what occurs after your birth. Human life begins at conception, when a sperm burrows its way into and fertilizes an egg. The event has been documented by scientists to cause a bright flash of light. An explosion of sparks erupts from the egg at the very moment of conception, which also signifies GOD's placement of a soul inside a woman's womb. The event has also been observed in animals, so animals have their own versions of souls. You spent approximately 40 weeks inside your mother's womb, in the water sac, upon being birthed as a crying baby into this flesh world. The system that you're born into is called the matrix, which means womb (rechem), where conception takes place. In biblical numerics, the number "40" repesents probation. The photo above shows a baby at 8 weeks into probation. This first probationary period is outside of the baby's control, but the second probation, as a Christ man in the wilderness is based on an individual's faith, decisions and actions (study: The House of Bread).